Medway Sub-Aqua Club is proud to have adopted the Hamburg-Amerika Line SS Pomerania, a wreck off Folkestone, Kent, not to be confused with the Canada-Pacific Pomeranian that sank off Portland Bill with tragic loss of life. The Pomerania lies on her port side with the bow to the East, at a depth of 25 metres, standing 6m proud, at 51"02'43N - 01"18'48E and although very broken up, is one of the most beautiful wrecks off the Kent coast. The SS Pomerania was a German ocean liner steamer that was built in 1873 and measured 360-feet by 40-feet at 3382grt, and carried 109 passengers. She produced 600 horsepower from a two-cylinder compound engine. 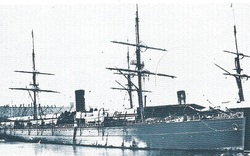 Sailing for the Hamburg-Amerika Line under the command of Captain Schwensen, she made regular trips between New York and Hamburg via Plymouth.On 25 November, 1878, she was hit amidships on her starboard by the iron-hulled Welsh barque Moel Eilian off Folkestone and sank in less than half an hour. The Moel Eilian was too badly damaged to assist, barely making it to Dover. Fortunately, the steamer Glengarry was nearby and came to the rescue. Accounts vary as to whether there was loss of life, although local records seem to indicate that there was not. (It seems probable that the Pomerania and the Pomeranian have been mixed up in several sources).Extract from Dover's National Sailors Home booklet, published 1903: German mail steamer Pomerania . She was run down off Folkstone on 26 November 1878. Fortunately, in this case, the whole crew and passengers were saved. One hundred and seventy-two passengers and crew were received into the Home, and as they had lost all their belongings, were clothed and all necessities attended to. On 26 November, ninety-nine were sent by the L.C and D.R., seven by the South-Eastern Railway and the remainder to Ostend by the mail boat. While she is very broken up, parts of the decking are still intact. Parts still stand proud and there are plenty of holes and places to investigate. Cog wheels from clocks still litter the hold. 2008-2010 were not good years for diving out of Dover, and out of many dives planned, only one was accomplished, with little result, other than the confirmation that there superficially appeared to be little change from 2007.